Take an early morning guided walking tour of Dashaswamedha and Manikarnika ghats in Varanasi along with a boat ride on river Ganga during the sunrise. Get the deep experience of morning Boat ride and Yoga that will be a new day routine in your life. Morning boat ride on The Ganga fills freshness in your life and “The ancient way of exercise” not only purifies your brain but also energies you for the whole day. Our expert guide will make you familiar with the history of Ghats, Varanasi temples and Culture around Ghats. Our expert will explain in detail the importance of Dashashwamedh, Manikarnika and city in the life of a Hindu. The driver will pick up the guests at 5:00 am from the hotel and drive to Assi Ghat. We will start our walk from Assi ghat where we meet our guide. Assi Ghat is known for Yoga, Aarti and lots of water activities, enjoy watching the traditional ceremonies along with the walk by the river. Yoga is practiced everyday morning at Assi Ghat, we can watch or we can even try some asanas there. Proceed to walk till Dashashwamedh Ghat and take a boat ride on the river Ganga with the stunning view of sunrise. We head towards Manikarnika ghat on boat and observe the Hindu traditional way of living along the banks of river Ganga. The boat ride lasts for an hour. Also, this is a place where cremation process happens and is believed that one will attain salvation/moksh if cremation is done here. We will return to Dashashwamedh ghat by walk and visit Kashi Vishwanath temple, which is a must visit a temple at Varanasi. After the visit, the guests are dropped back to the hotel. The driver will pick the guests from the hotel or residence. Please provide the complete address in the booking check out page. 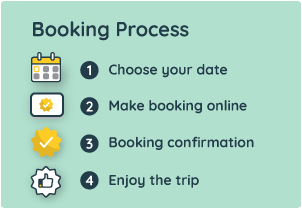 All reporting details are shared in the booking voucher.